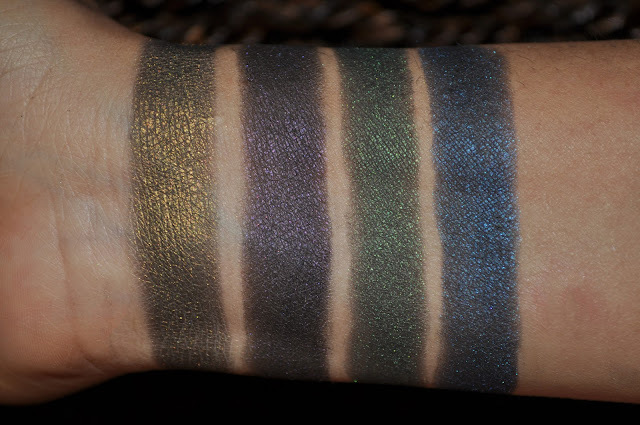 Ground control to Major Tom, Commencing countdown, 4,3,2,1... a review and swatches of Too Faced Galaxy Glam Baked Eye Shadows. 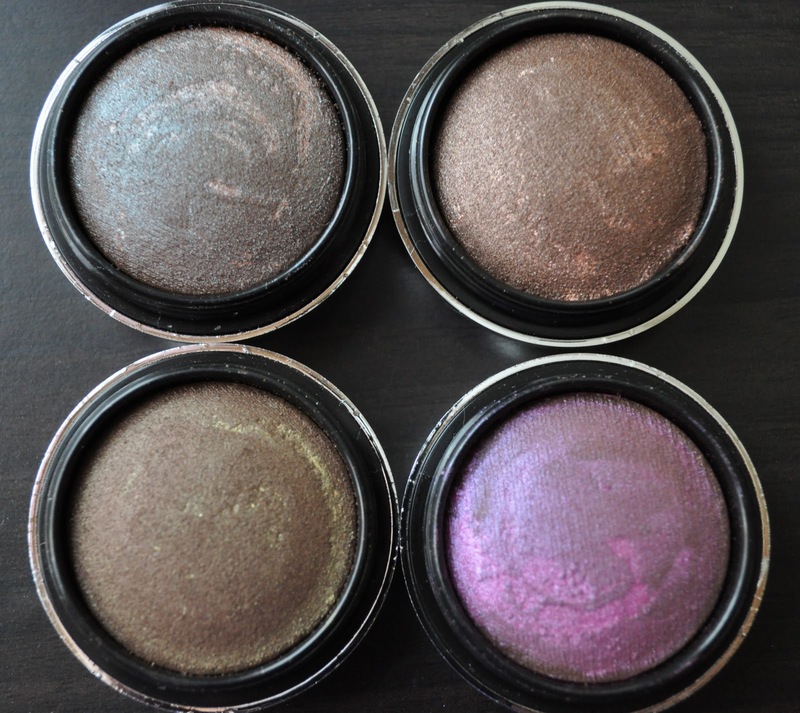 Galaxy Glam Baked Eye Shadows are available in eight colors, each shadow has either a black or brown base with swirls of an iridescent contrasting color; and can be applied wet or dry. 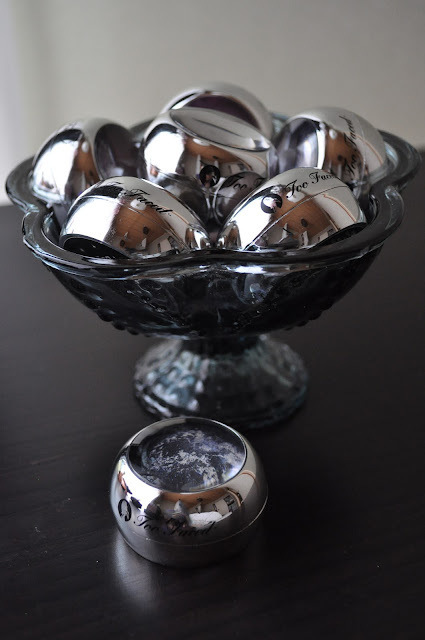 The packaging of these eye shadows is a futuristic ( feels more like some late 1960's-70's retro space decor) dome shaped mirrored plastic capsule with a twist off magnifying telescope lens lid. Shooting Star: A black based tarnished gold. Super Nova: A black based deep smokey purple with pink and peach sparkles. 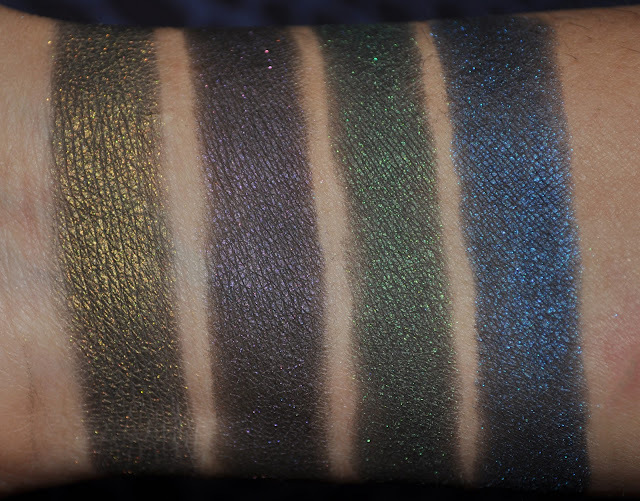 Moon Beam: A black based forest green with an emerald green sheen. Deep Space: A black based sapphire blue. Cocoa Comet: A cocoa brown with a shy blue duo-chrome. Love this one! Mocha Meteor: A bronzed fawn brown with gold shimmer. 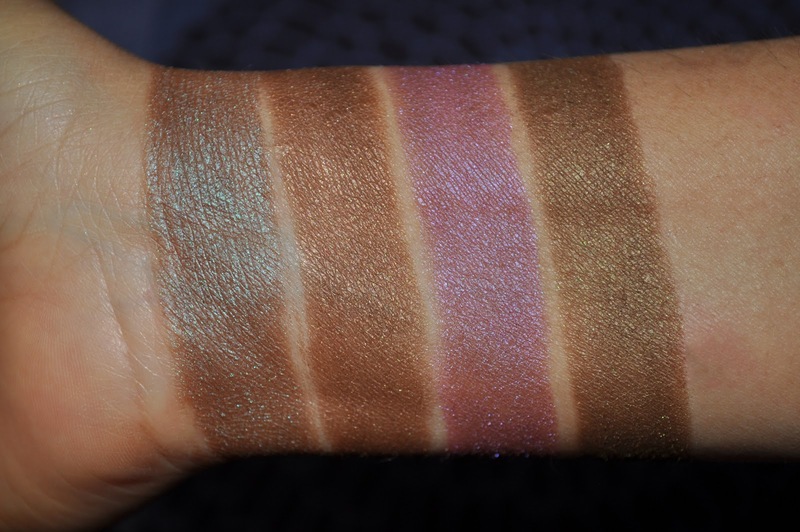 Magenta Moon: A brown based purple pink with a lilac sheen. Amber Asteroid: A yellow based brown with a pale gold/green shimmer. 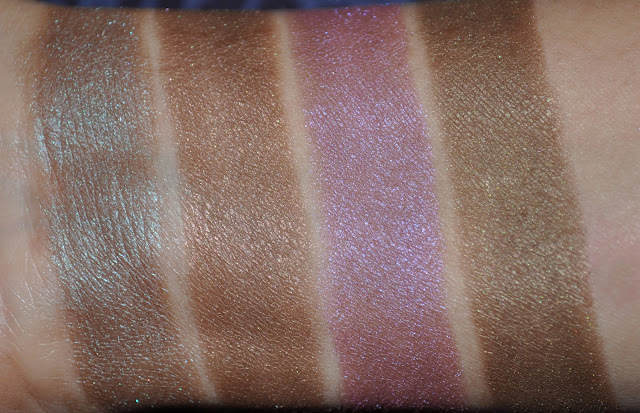 Too Faced Galaxy Glam Eye Shadow's have stellar pigmentation and a "I Can't Believe it's not Butter" texture on the lids. Depending on the brush size (and the amount of swirls in the shadow), one can apply each shade individually; but I prefer to swirl all colors together to expose the marvelous duo-chrome sheen of these shadows. 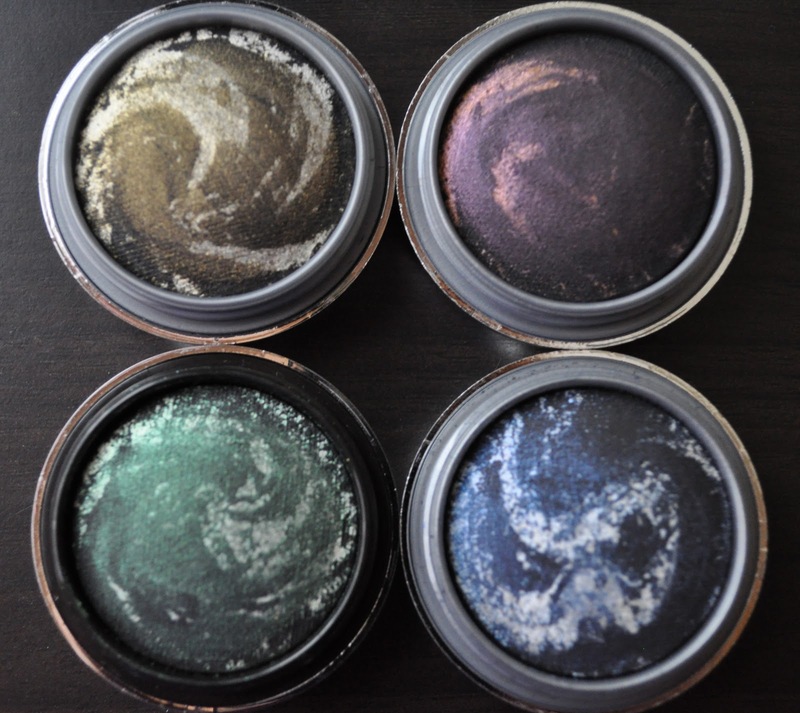 The Price of these Galaxy Glam shadows may have a Kryptonite affect on the wallet, at $19.50. This amount may seem astronomical for some, but occasionally, I've seen Galaxy Glam's on sale for as low as $6 on toofaced.com during their regular vintage sales. Do these shadows have you blasting off into space?